Picking up when the light consumes Damon and Bonnie, an eye peeks open to see what’s happened. They wander into town. There’s not a soul around. That’s weird – the cars are twenty years old, yet look brand new, and the Gilbert house is pristine. Damon finds a paper dated May 10, 1994. Just then, an eclipse sets in. Bonnie believes Grams sent her here, and when Damon grabbed her hand, he was transported along. He’s still a vamp, but Bonnie has no magic, so getting home won’t be easy. After Elena packs away everything that reminds her of Damon, she informs her friends of the memory wipe plan. Surprisingly, Caroline is the least on board, questioning what’ll happen once they get Damon back, but then channels Bonnie and says Elena should do what’s for the best. Caroline rants to Alaric that no one’s trying to save their friends. Well, he wouldn’t say, “No one.” Cut to Enzo macking with a witch. Caroline interrupts and takes him for a ride, but Stefan’s already exhausted the lead the witch gave him. Alaric preps Elena for compulsion; it’s hypnotherapy and memory reprocessing. Legit. They need to erase the signature memory – the moment she knew she’d love Damon forever, and that will set off a domino effect. He asks, “Who was Damon Salvatore?” And she replies, “He was my boyfriend. I loved him. And he died.” She brings up memories of their first meeting in the street, their first kiss on the porch, the Miss Mystic Falls pageant, the sire bond, their night in a Colorado motel, and each time … “Who was Damon Salvatore?” “He was my boyfriend. I loved him. And he died.” Getting frustrated, Elena tells Ric she’s done. In Savannah, Ivy preps breakfast, but Stefan’s not thrilled. She admits she’s super into him and wonders why he’s only intermittently into her. To make amends, he’ll cook dinner. Stefan simultaneously chops veggies like a boss and snacks on a blood bag. Elsewhere, Damon cooks pancakes and downs bourbon. Ivy enters with his friends. 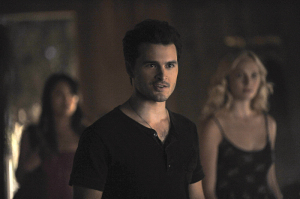 Upon seeing Stefan, Caroline is not amused, and the awkward group dinner doesn’t help. Enzo stabs Stefan with a fork, and Caroline compels Ivy away. In a tussle, Enzo and Stefan rip apart the room. Alaric calls Caroline for insight; Caroline knows Elena’s not being honest with herself since she fell in love with Damon when she was with Stefan. Whoops, Stefan overhears. He chased every lead he found and got nowhere, then decided he had to move on away from everything, including Caroline. Didn’t he hear her messages that she was completely falling apart without him? Nope, he never listened to them. Alaric tells Elena to be honest with herself, and, teary, she recalls when Damon returned her necklace at her 18th birthday party despite knowing it represented her love for Stefan. It was the most selfless he’s ever been, and she loved him. Alaric wipes the memory, and all the others of Damon domino down. She remembers Damon snapping Jeremy’s neck. “Who was Damon Salvatore?” “He was Stefan’s brother. He was a monster. Then he died.” Ready to party, Elena calls Caroline, who’s wallowing for a moment. Enzo hops in then immediately out of the car to scold Stefan for making someone like Caroline cry. Enzo snaps Ivy’s neck and vows to torment Stefan; brothers don’t give up on one another. A disapproving Matt walks in on half-naked Sarah (Elena’s snack last week). She’s got a stolen car and a dad in town that Tripp, who’s a Fell, will look into. Jeremy leaves Bonnie another railing voicemail she’ll never get, but he’s convinced she deserves them for having told him over the phone that she would die. Matt ponders how much Tripp knows about the town, as Trip drives a van of vamps into the sunlight of Mystic Falls. Having repeated the same day for two months, Bonnie still can’t figure out 27 across in the newspaper’s crossword or how to conjure up magic even with her grimoire. Months later, Damon spots the finished crossword and congratulates Bonnie, only she didn’t finish it. There’s someone else there! – This episode was thoroughly impressive. Not only did it include an emotional theme park of rollercoasters along with a lighter storyline that felt just as fitting, but it also utilized its main characters infinitely better than past seasons, which has been one of my biggest criticisms. The tone reminded me of an episode of Chuck in that it was part dramatic and part comedic, and yet each aspect was just as engaging as the other and befitting to the situations at hand. Who knew Kat Graham has such good comedic chops?! – I had forgotten just how snarky and wonderful Julie Plec’s writing can be, and it’s all due to the little things: Enzo being a “neck guy.” Bonnie stabbing pancakes with a pencil. Lines being repeated until the payoff is astounding. Alaric’s way to gauge the success of his compulsion by asking Elena who Damon was seemed like a simple enough concept, but the way in which Nina Dobrev bitterly remembered Damon at the end was a heartbreaking moment even though we expected it. – Thankfully, the compulsion process for this task was much more elaborate than we’ve seen in the past. It would have been hard to believe that erasing someone of this importance from Elena’s life took two seconds and that was that. Spanning much of the episode, it was neither too long nor too short of a story. The emotional punch that the process had was further developed once you see Elena completely flip the switch and resort to being a carefree college girl. – The walk down memory lane of Elena and Damon’s relationship contained a few flashback clips to past episodes, which gave the story more of a realistic feel as well as saved the producers some money to reallocate for the numerous song rights needed in the episode. It was a tradeoff (less new scenes in return for more songs) that didn’t feel like a tradeoff. – Tripp is shaping out to be quite an interesting man. The explanation that he took his mother’s maiden name when he decided to go by the nickname “Tripp” so he wouldn’t be “Tripp Fell” was a humorous work of genius, and I wonder if the writers picked the name solely for the joke. Colin Ferguson has managed to pull everything off in such a charming manner, including incinerating people while wearing an endearing grin. – Although Damon and Bonnie are stuck in 1994, my first thought this episode was that they were stuck in an episode of Heroes. Eclipse. No powers. General craziness. – What is the significance of the May 10, 1994 date? Perhaps an important day in Bonnie’s life or the day something changed for Mystic Falls? – Enzo and Caroline were both granted the opportunity to shine in this episode. Caroline’s character works best when she’s holding others accountable and somewhat falling apart herself. It’s equally beautiful and sad to watch. Enzo has grabbed my approval as a character, being a strong, sassy man also willing to call Stefan out on choices, but being more villainous in his approach. His protective nature over Caroline was a cute added touch. – While it’s not surprising given his upbringing, it’s nice to see Matt acting like a parent to Jeremy. Matt’s strength and responsibility is admiring, and I hope they continue to weave him into stories that utilize this.